Natural disasters – including cyclones/hurricanes, floods, droughts, earthquakes and volcanoes – have impacted 3.5 billion people totalling an estimated US$1.9 trillion in economic losses since 2000. Understanding Disaster Risk – Earth observation (EO) improves accuracy of disaster forecasts. Strengthening Disaster Risk Governance – Earth observation improves government’s planning and prioritisation of disaster response. 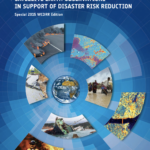 Investing in Disaster Risk Resilience: Earth observation supports a robust insurance market through improved calculation of risk. Enhancing Disaster Preparedness for Effective Response: Satellites provide critical national communications infrastructure, particularly when terrestrial networks are damaged or absent in remote regions. The unique benefit that space solutions provide is global, repeatable, scalable data that can deliver high value insights about our dynamic planet, especially within developing countries where existing data and insight is poor. International Partnership Programme: ﻿A UK Space Agency initiative that uses the UK Space sector’s research and innovation strengths to deliver a sustainable, economic and societal benefit to undeveloped nations and developing economies. IPP has 10 disaster resilience projects.